NEW YORK (Reuters) - Adult film actress Stormy Daniels, who has claimed she had a sexual encounter with U.S. President Donald Trump a decade ago, said on Wednesday that she has written a no holds barred memoir about her running legal battles with Trump and her life as a stripper. Daniels, 39, whose real name is Stephanie Clifford, said on ABC's "The View" that her book, "Full Disclosure," would be released by St. Martin's Press, a subsidiary of MacMillan Publishers, on Oct. 2. Trump’s longtime personal lawyer Michael Cohen has pleaded guilty to violating federal election law by paying Daniels $130,000 not to disclose information that would be harmful to Trump. St. Martin's Press said in a statement that Daniels' book would describe "the events that led to the nondisclosure agreement and behind the scenes attempts to intimidate her." 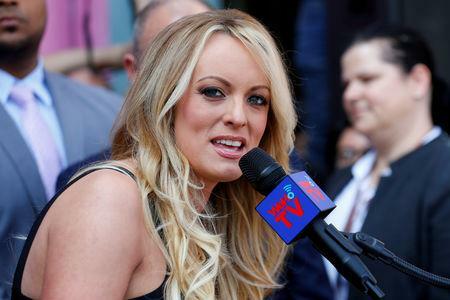 Earlier this year, Daniels said that in 2011 she was assailed by a man in a Las Vegas Parking Lot who threatened her if she discussed her alleged sexual encounter with Trump. In a tweet Trump described her claim as a "total con job."